Beautiful and performs very well. As far as the RGB feature, you will not find anything better. The colors are bright and very fluid. Knocked a star off only because of the price. If you do not care about the RGB aspect of RAM, you can get some very affordable high performance RAM for much cheaper. Well, these LEDs are AMAZING and I really love how I can set the colors in 5 different areas. I have had random times where the LEDs just turned off randomly, but re-applying the color settings in the G.Skill program and it goes back to normal, eventually my first set just stopped working entirely though. I also have only been able to get my Ram to 2933MHz, this specific one isn't as compatible with the X370 Pro Carbon Mobo, so I recommend getting the 3200MHz one (GET CL14, NOT CL16) . People seem to be having less problems with those. I definitely did not need this much RAM, but I couldn't just put two in my rig, so here we are. Gorgeous. After bios updates killed my last set of RAM, the current set has remained to be "lit"
It's RAM. Fast RAM. 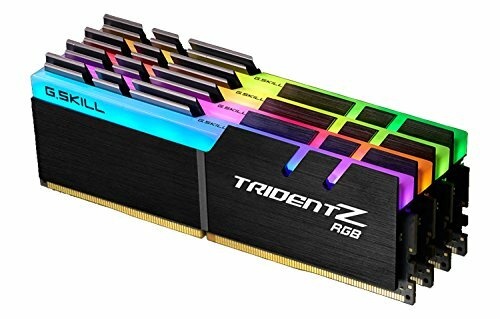 Fast RAM with RGB. Works at 3200MHz with 14-14-14-34 timings with XMP. Trident Z RGB delivers! This stuff is great. XMP 2 profile worked great. No issues hitting 3200 speed. 32GB of ram is fantastic. The color sync with ASUS aura works really well. It's nice to have everything work off a single program. It's expensive, but have you seen how cool it looks? Oh, and it does look absolutely gorgeous, but yeah, it comes with the RGB tax. Don't get this if you don't care how it looks, you're throwing money out your windows.